On January 13th, the Minnesota Wild were in need of salvation. With a lukewarm 18-19-5 record, the Wild seemed destined to join the Twins, Vikings and Timberwolves in Minnesota pro sports purgatory by missing out on the playoffs in the 2014-2015 season. And then an angel named Dubnyk arrived from Arizona. The Wild acquired 28-year old Saskatchewan native Devan Dubnyk from the Arizona Coyotes a week before the All-Star break. Dubnyk, a journeyman goaltender, has been Minnesota hockey’s personal savior since heading north, resurrecting Mike Yeo’s underachieving squad from the depths of mediocrity and restoring the faith of Wild fans. 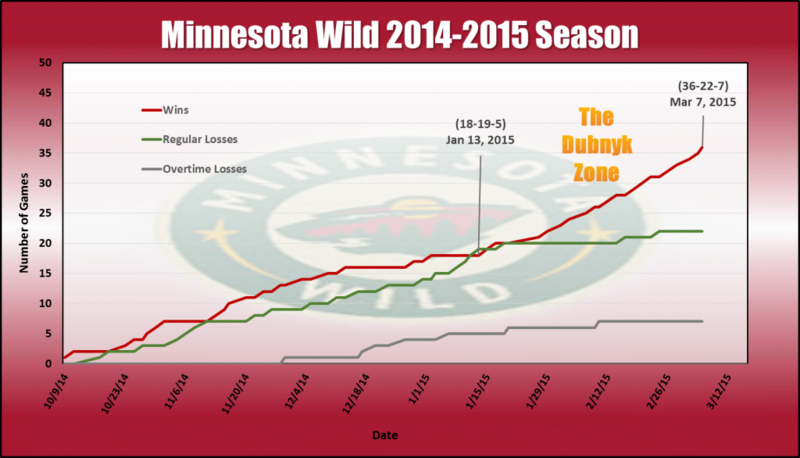 Since January 15th, Dubnyk has started every game for the streaking Wild. Through March 7th, he’s gone 18-3-1 with a .940 save percentage and a 1.60 GAA, while pitching 5 shutouts from between the pipes. As a result of Dubnyk’s stalwart netminding, with fewer than 20 games remaining on their schedule, the Wild are poised to capture a playoff spot when the regular season concludes about a month from now. As you can see from the data, with Dubnyk’s arrival Minnesota seemed to be born again, and their results on the ice have been remarkable. Since #40 first donned a red and green jersey on January 15th, the Wild’s wins have stacked up (18) while their losses have been few and far between (2 regular, plus 3 in overtime). This second half regular season surge might be just the beginning of bigger things for the Wild this year. Historically, top notch goaltending is a key part of the formula for teams who’ve found success in the playoffs. Minnesota has a very talented roster of skaters and, if they can stay on track and lock up a decent seed for the postseason, may set out on a spirited run at hockey’s holy grail: Lord Stanley’s Cup. Dubnyk has started two games after the chart above was created –a loss to the Avalanche and a dominant victory over the New Jersey Devils.